Formglas works closely with architects and designers to develop and design solutions for projects applying for LEED® certification. 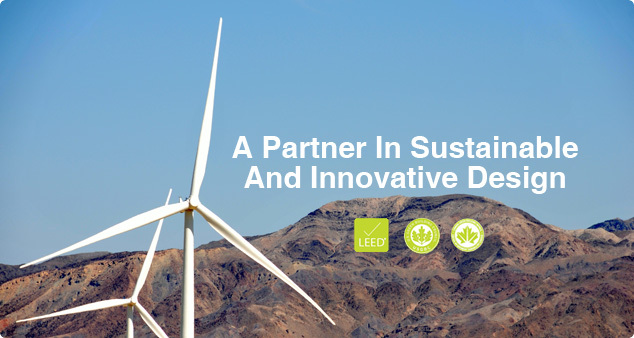 We have been a proud contributor to many LEED® building projects around the world. Sustainable construction is about accountability for our environment and a commitment to creating healthy work and living spaces. Our alignment with these principles is evident in several ways. Our choice of materials used in the creation of our products are of the highest quality. We maximize the use of recycled and low-emitting material wherever possible. We prefer materials that have been responsibly extracted and processed by suppliers who have third-party-verified supply chain optimization programs. Our internal operations team maintains a continuous focus on energy and material savings. Our main manufacturing facility was designed to create a streamlined footprint with a roof that brings natural light to the production floor, thereby reducing energy consumption. Process water is filtered and recycled where possible for use in finished products and other operational purposes. And, although waste and scrap in our fabrication process is relatively small, it is closely measured, recyled or internally reused. Our products and solutions provide broad benefits when used in "green construction". Made to size, there is virtually no waste in their installation. Formglas products contain low or VOC-free emitting materials and coatings. In some applications, they can be designed with an eye for reuse in future renovations. And, perhaps the most overlooked benefit of Formglas materials is that they require less supportive framing than traditional material assemblies. LEED® and Green Building Rating SystemTM are trademarks of United States Green Building Council. Canada Green Building Council. Formglas products can be applied to the Green Building Rating System, but determination of product attributes for LEED certification is the responsibility of the LEED® applicant.